Medical Bills are a way of life. Most of us will have them at one time or another and I’m sure we all could use a way to save on them. With my son’s Type 1 Diabetes, my daughter’s epilepsy, and just general medical upkeep for a family of six, we incur quite a few medical expenses each year. With a grateful heart, I can honestly say that God has provided for each of them and I know I can trust him to do so in the days ahead. Because our money is not our own, we are just stewards of it…I want to be wise in how I spend it…even on medical bills. So, my little tip that will save big may sound simple and void of the ability to save you big money, but hear me out, and I think you’ll be convinced. So, here it goes… Keep Good Records. Yep, that’s it. Keep Good Records. How will this save me money? I knew you would ask and since today alone, I saved $152…here goes. Doctor offices, medical supply companies, hospitals, ERs, specialists, labs, and radiology departments are all places that our medical bills come from, and with bills coming from many directions, they are hard to keep up with. Since they don’t all come at the same time each month, are different amounts, and differ based on our current medical visits, keeping track of medical expense records is so important. Billing departments make mistakes, and in regard to many of our accounts, mistakes happen often. If you work in a medical billing office, I’m not blaming you for the mistakes, I’m just saying they happen. I have made countless mistakes in this blog post already, have had to go back and correct them, and I’m sure I’ll miss a few and won’t correct them. This same thing happens when people are keying in dollar amounts, setting up payment plans, and entering account numbers… mistakes happen. The bad thing about these mistakes is that it can cost YOU, the patient or bill payer BIG money. Unfortunately, many of these mistakes are not caught by the billing department right away, or ever, so I encourage you to start keeping really good medical billing records of your own. Here is the number one thing you avoid by keeping good records and it’s a BIGGIE! Avoid paying the same bill or for the same service or product twice. This is HUGE and happens more than you know. Just a few weeks ago, I got a bill from a hospital for $25.34 and knew I had payed it. I called the billing department and they said they never got the payment. I use online bill pay so I had evidence that I had payed it. I made a call to my bank, they confirmed that the payment was made electronically from me and a check had been sent and cashed by the hospital billing department. As to whose account it was credited to…I may never know, but I payed it and confirmed payment and now my slate with that hospital is clean. Just this morning, I was on the phone with one of the medical supply companies we deal with. I got a bill yesterday for $152 for products purchased last August, September, and October. Because I have kept good records, I could easily pull out my list of dates of purchase and amounts paid, and mark all of their billed amounts, incorrect. After my conversation with them, they agreed and my account stood at zero. I was telling a friend this story and she said, “I would have never known and would have just payed the bill”. THIS is why I keep good records. Another example of this and something else to watch out for came from a bill we received from our family doctor’s office. There are six of us that see the same doctor and so when I got another bill from him, I wasn’t really surprised. But, when I started to pay it, I thought I’d check to be sure that I hadn’t already paid this one. The bill was for my visit to the doctor and I actually had paid it. I called the doctor’s office and they began searching through our payments and realized that it was credited to my husband’s account instead of mine. He had a credit of $72.20 and I still owed $72.20…hmmm?? Anyway, they moved the credit from his account to mine, and that was another one I could mark off my list. Do you get the idea? This happens often and in the busyness of life, many of us just pay the bill to get if off our desk or assume that the billing company is always right. You must keep good records if you want to avoid this very common problem!! 1. 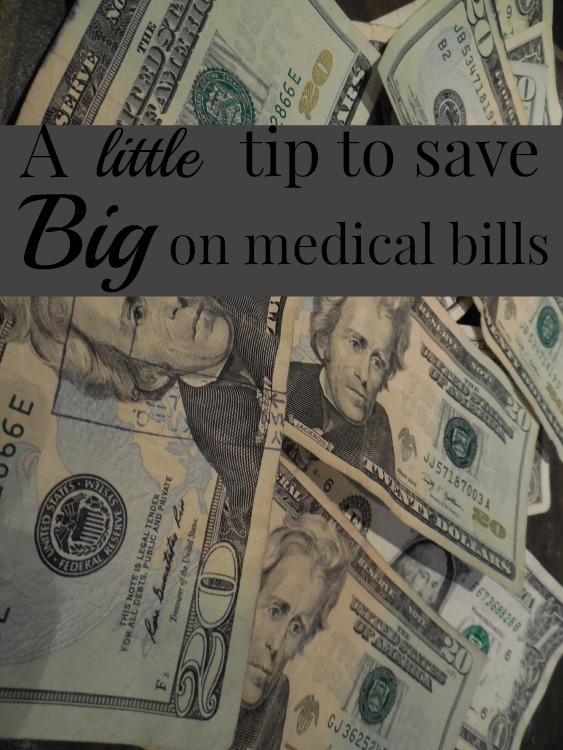 Keep a separate spreadsheet of medical bills. 2. Record who the bill is from, the date of service, the patient, the amount of bill and the amount paid (if different), and the date of payment. 3. Keep track of how much you have paid toward your deductible and out-of-pocket expenses. Our insurance company messed up this year and I caught it. They sent me a check in the mail for their mistake! 4. Shop around for medical supplies and prescriptions. Our big “stuff mart” does not have the best prices on prescriptions. 5. Take advantage of fuel perks and “transfer a prescription” offers. Every little bit helps. 6. Don’t be afraid to stand up for you and your money. You work hard for you money, don’t let it slip away because of someone else’s mistake!!! So glad I am Canadian and do not have to worry about medical bills. What a hassle! !